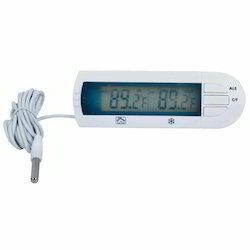 Being a well established organization, we bring forth an excellent assortment of Digital Fridge Thermometer. Our offered thermometer is widely appreciated by our prestigious clients for their precise design and durability. The offered thermometer can also be availed in various sizes, designs and other related specifications. We are engaged in manufacturing and supplying of Refrigeration Thermometers. These are used for measuring & regulating humidity & temperature, and used in refrigeration. We make sure to safely pack these before delivering to the customers. We are indulged in offering Refrigeration Thermometer to our clients. 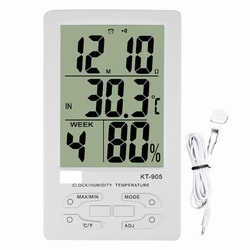 The Thermometer is fitted with a specially designed seasoned Wooden Frame/Plastic Body with C & F combined scale. Body Size : 200 mm x 22 mm. STD. TEMP. Ranges : 0° to 50°C, 0° to 100°C, 0° to 150°C, 0° to 120° F.